At the early stages of their life, panda cubs are dependent on their mothers. When they are more mature at around one and a half to two years of age, they venture off into the wild without their mother. 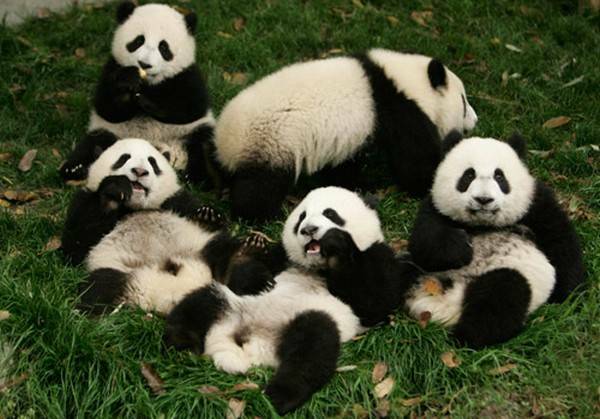 When a baby panda is born, they are small, pink, and they have sparse tiny white hairs covering their bodies. They weigh only a few ounces. A cub is about seven inches long with their tail making up about 1/3 of their length. Panda cubs are born blind with their eyes tightly shut. They cry loudly to get their mother's attention. Crying allows the cub to communicate its needs and bond with its mother. After one week, the cub starts to grow patches of black fur around their eyes and shoulders, and later on their legs, ears, chest and paws. Black fur continues to grow on the cub and it becomes thicker. White fur grows, too. The cub is regularly licked by the mother to clean them and stimulate excretion. At around one month old, the panda cub weighs about four pounds and looks like an adult cub, but with a longer tail. The panda cub starts opening its eyes after one month, and one to two weeks later is able to fully open them. At three or four weeks of age, the cub does not need constant contact with the mother for warmth as it can regulate its body temperature better. Suckling occurs often with the cub being dependent on its mother's supply of high-fat milk. At two months, the cub has grown a bit more, and now weighs about 10 to 12 pounds. At two months of age, the cub stops crying. The mother continues to suckle the cub at two months, usually three to four times each day. After about 75 to 80 days, the cub is able to stand and starts taking its first steps. Also around this stage, the panda cub starts growing teeth. The cub's eyesight and hearing begins to improve. Suckling occurs two to three times each day. At four months old, the panda cub is active, but it is yet to fully develop its motor coordination. It can run a little and crawl onto its mother's back. By the fifth month, the cub follows its mother around and copies her as she is climbing trees and eating bamboo, although the cub cannot eat solids yet. The panda cub is also now able to sit alone in a tree for hours long. By the time the cub is six months old, it can eat solids with its set of 26 to 28 teeth. These are temporary teeth that are replaced with permanent teeth at the age of one. Now able to consume some bamboo, the cub quickly gains weight. Suckling takes place one or two times in a day, which may continue until the cub is 8 to 9 months of age.